Gift Vouchers are valid for 12 months. Conditions may apply to the recipient for bookings made during public holidays and peak periods. Please contact us if you have any questions. Is there someone special that you want to treat a night or two at SiloStay? 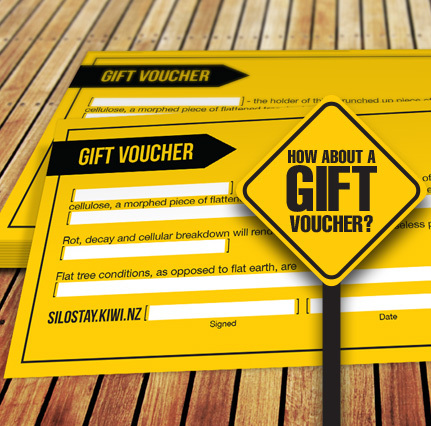 How about sending them a Gift Voucher!? Fill out the form and we will get in touch with you via email with a secure payment link. We can even add a greeting card from Little River Gallery for an extra $6.50. Yes! I would like a greeting card too. Would you like a message to go with it?